Day in and day out, your local Firefighters work hard to keep your community safe and in doing so they work up quite an appetite! Steak-umm knew that firefighters would be the perfect test group to try its new and improved meat products after recent rebranding efforts. Steak-umm challenged firefighters to use Steak-umm products to create original recipes and submit them to the “Steak-umm Firehouse Challenge.” What better way to share the 100% meat of Steak-umm products than with firefighters who give 100% every single day? Fans voted on their favorite recipes and for each vote, Steak-umm donated ten cents to the National Fallen Firefighters Foundation. After hundreds of entries and thousands of votes were counted, three recipes stood out among the rest. 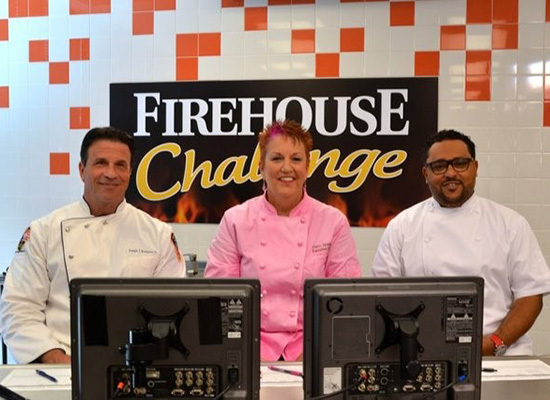 The firefighters with the top three recipes competed in the “Steak-umm Firehouse Challenge Cook-off” to win the Grand Prize of $20,000 for his or her firehouse. In order for the cook-off to be successful, Steak-umm needed to bring in qualified chefs to judge the contest and choose the Grand Prize Winner. CelebExperts used its expertise in the culinary industry to find the right celebrity chefs for the Steak-umm Challenge. Choosing the final judges was no easy task. CelebExperts had an extensive vetting process to find the right chefs for the challenge based on location, budget and chefs who were willing to promote Steak-umm products. In addition to the aforementioned qualifications, judges also needed to be relevant to the competition as well as outgoing and personable, who can criticize and provide feedback on the recipes. After CelebExperts, branding agency, narrowed down the field of chefs who met the requirements, the final judges were determined. Chef Joe Bonanno, a former New York City firefighter, has made a name for himself as “America’s Greatest Firehouse Chef” and has written several cookbooks. Chef Kevin Sbraga was the winner of the seventh season of “Top Chef” and his namesake restaurant Sbraga was honored as “Best New Restaurant” by Esquire Magazine. Chef Pam Green became Atlantic City’s first and only female executive chef and continues to pave the way for women in the cooking world. These three chefs had the responsibility of judging the cook-off as well as completing media interviews and promoting the challenge through social media outlets. They provided invaluable exposure for Steak-umm and its products throughout the duration of the campaign. Previous post Why Aren’t Influencer Posts Driving Sales?